G-Wave Solutions launches a new family of fiber optic based Distributed Antenna Systems (DAS) products. The LightLink family of products enhances communication coverage in buildings and integrates system balance in RF shielded environments by allowing RF control for distinct operators in multi-operator deployments. By providing advanced RF design solutions, the Lightlink system is able support VHF, UHF, 700/800/900 MHz Public Safety applications as well as LTE, Cellular850, PCS and AWS communication services. 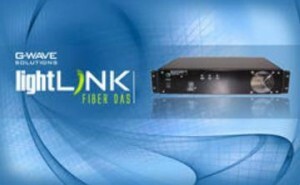 The LightLink fiber optic distributed antenna system uses single-mode optical fiber cable to distribute RF signals between a central RF hub and remote antenna units (RAU™) The wireless distributed system is comprised of a master distribution unit (MDU) that interfaces with RAU™’s placed throughout a building. RAU™’s are available in various power configurations to provide scalability in design, thereby improving performance and enhancing cost-effectiveness.